By the mid rounds of the super bantamweight unification showdown between Guillermo Rigondeaux and Nonito Donaire, it became abundantly clear that the Cuban fighter was in command of the action. Rigondeaux was successfully controlling the range, and not just through use of his feet. He also mixed in a varied assortment of head, shoulder, and upper body movement, all of which acted to befuddle and neutralize the uncharacteristically gun-shy Donaire. It was vintage Rigondeaux. He was slipping and sliding, moving and grooving, ducking and dodging, mesmerizing with a hypnotic pawing jab, maneuvering his foe into unfavorable positions, and when opportunity permitted, zapping the Filipino boxer with stinging sharp flush lefts. This dazzling display of finesse and skills left Donaire extremely reluctant to engage, and whenever he did let his hands go Rigondeaux was usually making him miss, sometimes wildly. Guillermo thoroughly succeeded in making an explosive specimen like Nonito look ordinary. The real test for Rigondeaux came following one of the few flaws in his performance, when he got a little too close in round ten and Donaire clipped him with a well timed thunderous left hook that sent the Cuban crashing down. With question marks often lingering about Rigondeaux’s chin, he was suddenly afforded the chance to prove his mettle and overcome adversity. It was a sink or swim scenario that arose out of nowhere. At first it was difficult to gauge exactly how badly hurt Rigondeaux was, but Donaire dutifully tried to capitalize on the situation and moved in for the kill. Despite his best efforts, however, Nonito never did land the finishing blow. In fact at one point he actually missed a combination of furious shots, all of which were evaded by the elusive Guillermo. After the knockdown, the action more or less reverted to prior form, with Donaire unable or unwilling to make something happen. This was arguably the only round which clearly favored the Filipino, and even then it contained a victory of sorts for Rigondeaux because he quickly regained his composure and showed strong recuperative powers. Donaire was just never able to establish any type of real rhythm. In the simplest of terms, Rigondeaux made Donaire fight his fight. While Donaire did land some powerful shots here and there, these were usually right hands that followed jab attempts. But Donaire was never really committed to using his jab, and whenever he did land a thudding shot, Ridondeaux almost always responded with a few zingers of his own. The fact that Rigondeaux was able to earn the Filipino’s respect helped set the pace to his liking while simultaneously serving to reduce his opponent’s output. Donaire was inexplicably far too reliant on trying to end things with one mighty blow and this played right into Rigondeaux’s strengths. In the post-fight interview Donaire noted a neglected surgery and ill preparation as reasons to explain his subpar performance, but at the end of the day Rigondeaux proved himself a cut above and exhibited an extraordinary blend of athleticism, smarts, and ability. Ultimately this did not turn out to be the super fight that many had hoped for. Indeed, the crowd was often booing the overall flow and lack of engagement. Casual fans do not tend to gravitate towards such encounters with high praise. Regardless, Rigondeaux has still proven himself an elite commodity in the sweet science. He has undoubtedly silenced many critics and shown the boxing world that his name deserves to be mentioned alongside the select few who find themselves in the upper echelons of universally recognized pound-for-pound talent. The former two-time Olympic Gold Medal winner and seven-time National Cuban Champion has now officially made his first big splash under the spotlight in the professional ranks, and while he may not have the most exciting style to watch, he does possess a great deal of skill that manifests itself in the art of hitting without being hit. His best days may well still be ahead, and it will certainly be interesting to see what he does next. 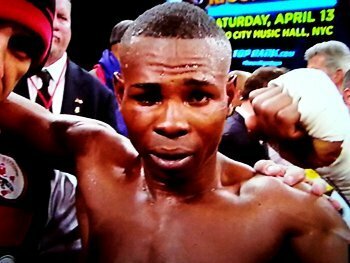 Previous boxing news: Rigondeaux Defeats Donaire: How Does This Shake Up The P-4-P Rankings?